Showcasing a serenely beautiful cushion cut Sea Blue Aquamarine surrounded by Chocolate and Vanilla Diamonds, this enchanting ring is ideal as a unique engagement ring or equally perfect as a glamorous accessory for formal events. Matching Band: 6205674. 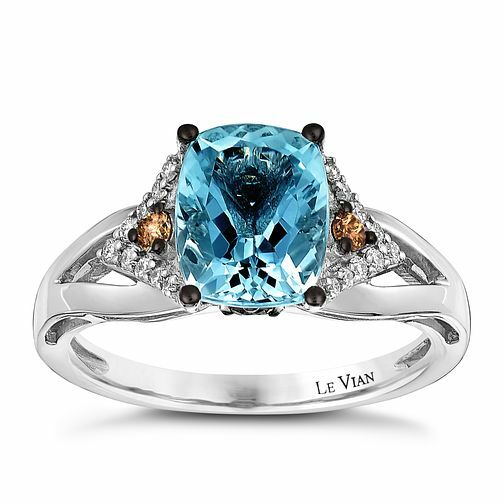 Le Vian 14ct Vanilla Gold diamond & aquamarine ring is rated 5.0 out of 5 by 1. Rated 5 out of 5 by Anonymous from Simply beautiful The brilliance and clarity of aquamarine sits regally on the diamond throne gives this ring an elegant and modern feel - a present from my husband!